After a week of glitter and the perils that come with removing it, I wanted to keep my nails relatively clean, with a bit more of a polished look than they appear au naturel. 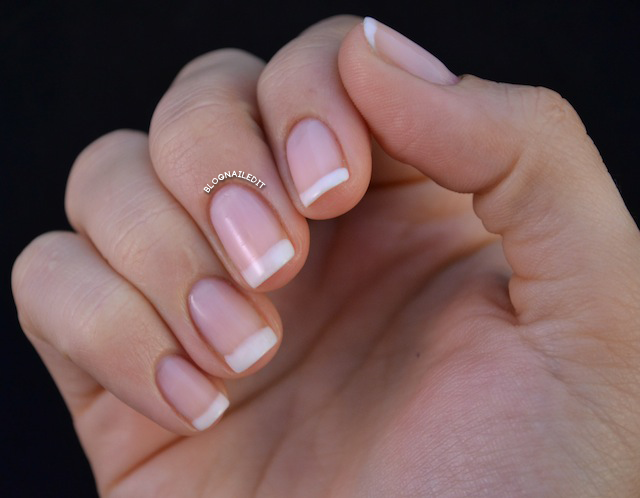 I decided to do a classic French manicure for this reason, but also because I wanted to show that french tips aren't necessarily tacky if done right, or at least with some forethought. I saw a post on RedditLaqueristas (a Reddit subreddit which I loyally follow) about how french tips are sometimes considered tacky (here). I wanted to do a French manicure the moment I read all of this. I'm please with the way it makes my nails look, and I'll tell you why. The lines mimic my natural nail lines almost exactly. If I had kept going down toward the cuticle with the white tips, it would start to look unnatural. 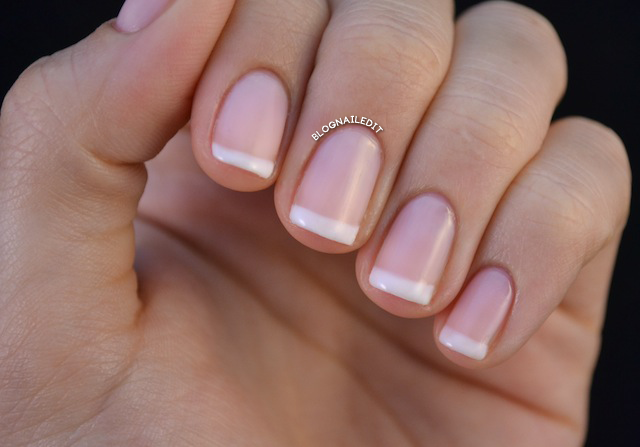 Here's how you should look at a French manicure. If your nails aren't as white as you'd like them to be, use the white tip to cover it up, but stop once you reach the natural white line on your nail. This means that a French manicure may not look good on your nails. When I had short, nail-bitten nails, I would glop on a lot of white, in the hopes it would make my nails look good, but it never really did. Just as wearing heels that are too high will actually make your legs look shorter and wider, overdoing the white polish line will make your nails look the same. I used two layers of You Callin' me a Lyre? (OPI) to start. I picked up this along with six other OPI colors from a discount beauty supply store one of my readers tipped me off to. It was like a candy store for nail polish. After those coats dried, I added two thin layers of Marshmallow (Essie). Both of these polishes are very sheer, and require lots of coats to reach the opacity of your typical creme. This is exactly why I chose these shades. They blend better with my nails' natural color and the line of Marshmallow doesn't appear as harsh. To top it all off, I added one last layer of You Callin' Me a Lyre?. That really blended everything perfectly and I may just leave this on longer than a day! I so agree! If done right a French can look classic, clean and feminine, just as yours does. LOL the link to the "duck feet" thread was hilarious. Your nails look great! we're mani twins :D this week I wanted to go with a softer, natural look, but not with my nekkid nails, so I did a french mani. I was hesitant, I *hate* french manis and haven't had one in over a year. But I went with OPI YCML? and DTMT (instead of Essie Marshmallow, which I don't own) and I love this look better than the "classic" french mani with stark-white tips.